The "Timetrack Panel" shows a symbol (usually a green dot) for every Waypoint in the timeline. Keyframes are represented by vertical lines through the timeline. The time cursor shows you with another vertical line at which frame you currently are at. 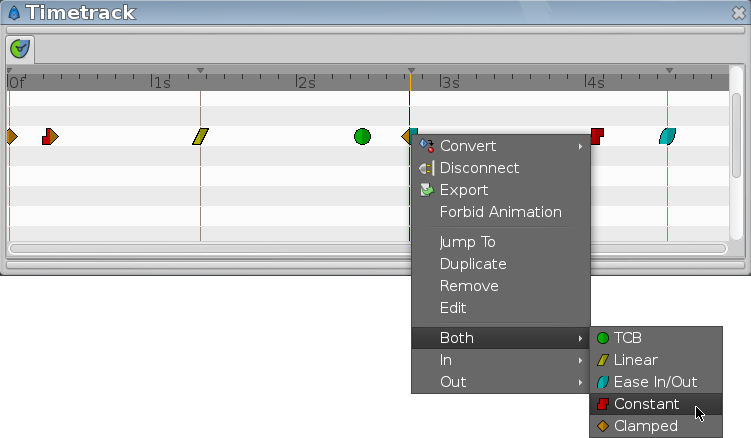 When you change an object parameter while in Animate Editing Mode, for example by moving an object, a Waypoint is inserted. The rows of the "Timetrack Panel" are aligned with the Parameters Panel. If you are animating the individual vertices, you have to expand the vertices list to see their individual waypoints. You can drag those Waypoints through time, and you can change their interpolation method by right-clicking (eg. a sudden step change instead of a smooth transition). You can also change the default interpolation method from the Toolbox Panel in the New Layer Defaults section. The very bottom control sets the default method, and is initially set to Clamped. Holding Ctrl allows you to select more than one waypoint for a given valuenode at a time. When things are already selected, clicking on a selected point does nothing (in both normal and add mode). Add mode clicking on an unselected point adds it to the set. Normal clicking on an unselected point will select only that one time point. Subtractive clicking on any point will remove it from the the set if it is included. Normal click out of a waypoint unselect all. Holding ⇧ Shift when beginning to drag waypoints will copy them rather than moving them. Holding Alt while clicking waypoints will delete them. Interested in futur things ? Waypoints ... what could be the future of...? in the synfig forum. This page was last modified on 2 July 2015, at 09:09.